Not to be confused with Indian National Congress (Organisation). Congress is a secular party whose social democratic platform is generally considered to be on the centre-left of Indian politics. Congress' social policy is based upon the Gandhian principle of Sarvodaya—the lifting up of all sections of society—which involves the improvement of the lives of economically underprivileged and socially marginalised people. The party primarily endorses social democracy—seeking to balance individual liberty and social justice, welfare and secularism—asserting the right to be free from religious rule and teachings. Its constitution states democractic socialism to be its ideal. After India's independence in 1947, Congress formed the central government of India, and many regional state governments. Congress became India's dominant political party; as of 2015[update], in the 15 general elections since independence, it has won an outright majority on six occasions and has led the ruling coalition a further four times, heading the central government for 49 years. There have been seven Congress Prime Ministers, the first being Jawaharlal Nehru (1947–1964), and the most recent Manmohan Singh (2004–2014). Although it did not fare well in the last general elections in India in 2014, it remains one of two major, nationwide, political parties in India, along with the right-wing, Hindu nationalist, Bharatiya Janata Party (BJP). [e] In the 2014 general election, Congress had its poorest post-independence general election performance, winning only 44 seats of the 543-member Lok Sabha. From 2004 to 2014, United Progressive Alliance, a coalition of Congress with several regional parties, formed the Indian government led by Manmohan Singh, the Prime Minister as the head of the coalition government. The leader of the party during the period, Sonia Gandhi has served the longest term as the president of the party. As of December 2018[update], the party is in power in six legislative assemblies: Karnataka (in an alliance with the JD(S)), Punjab, Rajasthan, Chhattisgarh, Madhya Pradesh and the union territory of Puducherry (in an alliance with the DMK). The Indian National Congress conducted its first session in Bombay from 28–31 December 1885 at the initiative of retired Civil Service officer Allan Octavian Hume. In 1883, Hume had outlined his idea for a body representing Indian interests in an open letter to graduates of the University of Calcutta. Its aim was to obtain a greater share in government for educated Indians, and to create a platform for civic and political dialogue between them and the British Raj. Hume took the initiative, and in March 1885 a notice convening the first meeting of the Indian National Union to be held in Poona the following December was issued. Due to a cholera outbreak there, it was moved to Bombay. Hume organised the first meeting in Bombay with the approval of the Viceroy Lord Dufferin. Womesh Chandra Bonnerjee was the first president of Congress; the first session was attended by 72 delegates, representing each province of India. Notable representatives included Scottish ICS officer William Wedderburn, Dadabhai Naoroji, Pherozeshah Mehta of the Bombay Presidency Association, Ganesh Vasudeo Joshi of the Poona Sarvajanik Sabha, social reformer and newspaper editor Gopal Ganesh Agarkar, Justice K. T. Telang, N. G. Chandavarkar, Dinshaw Wacha, Behramji Malabari, journalist and activist Gooty Kesava Pillai, and P. Rangaiah Naidu of the Madras Mahajana Sabha. This small elite group, unrepresentative of the Indian masses at the time, functioned more as a stage for elite Indian ambitions than a political party for the first decade of its existence. Congress "extremist" Bal Gangadhar Tilak speaking in 1907 as the Party split into moderates and extremists. Seated at the table is Aurobindo Ghosh and to his right (in the chair) is G. S. Khaparde, both allies of Tilak. Gopal Krishna Gokhale, a constitutional social reformer and moderate nationalist, was elected president of the Indian National Congress in 1905. At the beginning of the 20th century, Congress' demands became more radical in the face of constant opposition from the British government, and the party decided to advocate in favour of the independence movement because it would allow a new political system in which Congress could be a major party. By 1905, a division opened between the moderates led by Gokhale, who downplayed public agitation, and the new extremists who advocated agitation, and regarded the pursuit of social reform as a distraction from nationalism. Bal Gangadhar Tilak, who tried to mobilise Hindu Indians by appealing to an explicitly Hindu political identity displayed in the annual public Ganapati festivals he inaugurated in western India, was prominent among the extremists. Congress included a number of prominent political figures. Dadabhai Naoroji, a member of the sister Indian National Association, was elected president of the party in 1886 and was the first Indian Member of Parliament in the British House of Commons (1892–1895). Congress also included Bal Gangadhar Tilak, Bipin Chandra Pal, Lala Lajpat Rai, Gopal Krishna Gokhale, and Mohammed Ali Jinnah. Jinnah was a member of the moderate group in the Congress, favouring Hindu–Muslim unity in achieving self-government. Later he became the leader of the Muslim League and instrumental in the creation of Pakistan. Congress was transformed into a mass movement by Surendranath Banerjee during the partition of Bengal in 1905, and the resultant Swadeshi movement. Mahatma Gandhi returned from South Africa in 1915. With the help of the moderate group led by Ghokhale, Gandhi became president of Congress. 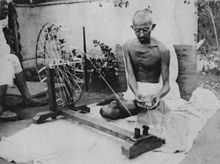 After the First World War, the party became associated with Gandhi, who remained its unofficial spiritual leader and icon. He formed an alliance with the Khilafat Movement in 1920 to fight for preservation of the Ottoman Caliphate, and rights for Indians using civil disobedience or satyagraha as the tool for agitation. In 1923, after the deaths of policemen at Chauri Chaura, Gandhi suspended the agitation. In protest, a number of leaders, Chittaranjan Das, Annie Besant, and Motilal Nehru, resigned to set up the Swaraj Party. The Khilafat movement collapsed and Congress was split. The rise of Gandhi's popularity and his satyagraha art of revolution led to support from Sardar Vallabhbhai Patel, Pandit Jawaharlal Nehru, Dr. Rajendra Prasad, Khan Mohammad Abbas Khan, Khan Abdul Ghaffar Khan, Chakravarti Rajgopalachari, Dr. Anugraha Narayan Sinha, Jayaprakash Narayan, Jivatram Kripalani, and Maulana Abul Kalam Azad. As a result of prevailing nationalism, Gandhi's popularity, and the party's attempts at eradicating caste differences, untouchability, poverty, and religious and ethnic divisions, Congress became a forceful and dominant group. Although its members were predominantly Hindu, it had members from other religions, economic classes, and ethnic and linguistic groups. At the Congress 1929 Lahore session under the presidency of Jawaharlal Nehru, Purna Swaraj (complete independence) was declared as the party's goal, declaring 26 January 1930 as "Purna Swaraj Diwas" (Independence Day). The same year, Srinivas Iyenger was expelled from the party for demanding full independence, not just home rule as demanded by Gandhi. Subhas Chandra Bose served as president of the Congress during 1938–39. After the passage of the Government of India Act of 1935, provincial elections were held in India in the winter of 1936–37 in eleven provinces: Madras, Central Provinces, Bihar, Orissa, United Provinces, Bombay Presidency, Assam, NWFP, Bengal, Punjab, and Sindh. After contesting these elections, the Indian National Congress gained power in eight of them except Bengal, Punjab, and Sindh. The All-India Muslim League failed to form a government in any province. Congress ministries resigned in October and November 1939 in protest against Viceroy Lord Linlithgow's declaration that India was a belligerent in the Second World War without consulting the Indian people. In 1939, Subhas Chandra Bose, the elected president in both 1938 and 1939, resigned from Congress over the selection of the working committee. The party was not the sole representative of the Indian polity, other parties included the Akhil Bharatiya Hindu Mahasabha, and the All India Forward Bloc. The party was an umbrella organisation, sheltering radical socialists, traditionalists, and Hindu and Muslim conservatives. Gandhi expelled all the socialist groupings, including the Congress Socialist Party, the Krishak Praja Party, and the Swarajya Party, along with Subhas Chandra Bose, in 1939. Azad Hind, an Indian provisional government, had been established in Singapore in 1943, and was supported by Japan. In 1946, the British tried the Indian soldiers who had fought alongside the Japanese during World War II in the INA trials. In response, Congress helped form the INA Defence Committee, which assembled a legal team to defend the case of the soldiers of the Azad Hind government. The team included several famous lawyers, including Bhulabhai Desai, Asaf Ali, and Jawaharlal Nehru. The same year, Congress members initially supported the sailors who led the Royal Indian Navy mutiny, but they withdrew support at a critical juncture and the mutiny failed. After Indian independence in 1947, the Indian National Congress became the dominant political party in the country. In 1952, in the first general election held after Independence, the party swept to power in the national parliament and most state legislatures. It held power nationally until 1977, when it was defeated by the Janata coalition. It returned to power in 1980 and ruled until 1989, when it was once again defeated. The party formed the government in 1991 at the head of a coalition, as well as in 2004 and 2009, when it led the United Progressive Alliance. During this period the Congress remained centre-left in its social policies while steadily shifting from a socialist to a neoliberal economic outlook. The Party's rivals at state level have been national parties including the Bharatiya Janata Party (BJP), the Communist Party of India (Marxist) (CPIM), and various regional parties, such as the Telugu Desam Party, Trinamool Congress and Aam Aadmi Party. A post-partition successor to the party survived as the Pakistan National Congress, a party which represented the rights of religious minorities in the state. The party's support was strongest in the Bengali-speaking province of East Pakistan. After the Bangladeshi War of Independence, it became known as the Bangladeshi National Congress, but was dissolved in 1975 by the government. From 1951 until his death in 1964, Jawaharlal Nehru was the paramount leader of the party. Congress gained power in landslide victories in the general elections of 1951–52, 1957, and 1962. During his tenure, Nehru implemented policies based on import substitution industrialisation, and advocated a mixed economy where the government-controlled public sector co-existed with the private sector. He believed the establishment of basic and heavy industries was fundamental to the development and modernisation of the Indian economy. The Nehru government directed investment primarily into key public sector industries—steel, iron, coal, and power—promoting their development with subsidies and protectionist policies. Nehru embraced secularism, socialistic economic practices based on state-driven industrialisation, and a non-aligned and non-confrontational foreign policy that became typical of the modern Congress Party. The policy of non-alignment during the Cold War meant Nehru received financial and technical support from both the Eastern and Western Blocs to build India's industrial base from nothing. During his period in office, there were four known assassination attempts on Nehru. The first attempt on his life was during partition in 1947 while he was visiting the North-West Frontier Province in a car. The second was by a knife-wielding rickshaw-puller in Maharashtra in 1955. A third attempt happened in Bombay in 1956. The fourth was a failed bombing attempt on railway tracks in Maharashtra in 1961. Despite threats to his life, Nehru despised having excess security personnel around him and did not like his movements to disrupt traffic. In 1964, Nehru died because of an aortic dissection, raising questions about the party's future. After Nehru's death in 1964, the congress party started to face internal crisis. There were differences among the top leadership of the Congress regarding the future of the party which makes lot of issues within the party. This resulted in formation of many congress named parties in India Kerela Congress, Orissa Jane Congress, Bangla Congress, Utkal Congress, Bharatiya Kranti Dal, etc. K. Kamaraj became the president of the All India Congress Committee in 1963 during the last year of Nehru's life. Prior to that, he had been the chief minister of Madras state for nine years. Kamraj had also been a member of "the syndicate", a group of right wing leaders within Congress.In 1963 the Congress lost popularity following the defeat in the Indo-Chinese war of 1962.To revitalize the party, Kamraj proposed the Kamaraj Plan to Nehru that encouraged six Congress chief ministers (including himself) and six senior cabinet ministers to resign to take up party work. After Nehru's death in May 1964, Kamaraj was widely credited as the "kingmaker" in Indian politics for ensuring the victory of Lal Bahadur Shastri over Morarji Desai as the successor of Nehru. The Congress was then split into two parties : Indian National Congress(O) and Indian National Congress (I) as a left-wing/right-wing division. Indira Gandhi wanted to use a populist agenda in order to mobilize popular support for the party while Kamraj and Desai stood for a more right-wing agenda. As prime minister, Shastri retained many members of Nehru's Council of Ministers; T. T. Krishnamachari was retained as Finance Minister of India, as was Defence Minister Yashwantrao Chavan. Shastri appointed Swaran Singh to succeed him as External Affairs Minister. Shashtri appointed Indira Gandhi, Jawaharlal Nehru's daughter and former party president, Minister of Information and Broadcasting. Gulzarilal Nanda continued as the Minister of Home Affairs. As Prime Minister, Shastri continued Nehru's policy of non-alignment, but built closer relations with the Soviet Union. In the aftermath of the Sino-Indian War of 1962, and the formation of military ties between China and Pakistan, Shastri's government expanded the defence budget of India's armed forces. He also promoted the White Revolution—a national campaign to increase the production and supply of milk by creating the National Dairy Development Board. The Madras anti-Hindi agitation of 1965 occurred during Shastri's tenure. Shastri became a national hero following victory in the Indo-Pakistani War of 1965. His slogan, "Jai Jawan Jai Kisan" ("Hail the soldier, Hail the farmer"), became very popular during the war. On 11 January 1966, a day after signing the Tashkent Declaration, Shastri died in Tashkent, reportedly of a heart attack; but the circumstances of his death remain mysterious. Indian National Congress (O) was led first by Kamraj and later by Morarji Desai. The "O" stands for organisation/Old Congress. Some people used to it the Original Congress. .
After Shastri's death, Congress elected Indira Gandhi as leader over Morarji Desai. Once again, politician K. Kamaraj was instrumental in achieving this result. In 1967, following a poor performance in the general election, Indira Gandhi started moving towards the political left. In mid-1969, she was involved in a dispute with senior party leaders on a number of issues. The two major issues were Gandhi supporting the independent candidate, V. V. Giri, rather than the official Congress party candidate, Neelam Sanjiva Reddy, for the vacant post of the President of India. The second issue was Mrs. Gandhi's abrupt nationalization of the 14 biggest banks in India, which resulted in the resignation of the finance minister, Morarji Desai. Later in the year, the Congress party president, S. Nijalingappa, expelled her from the party for indiscipline. Mrs. Gandhi as a counter-move launched her own faction of the INC. Mrs. Gandhi's faction, called Congress (R), was supported by most of the Congress MPs while the original party had the support of only 65 MPs. This was also known as Congress(I) was led by Indira Gandhi. The "I" in the name of congress stood for Indira. It was also known as INC(R) R stands for Requisition. It soon came to be known as the New Congress. In the All India Congress Committee, 446 of its 705 members walked over to Indira's side. This created a belief among Indians that Indira's Congress was the Real Congress (INC-R). After the separation of the two parties, there was also a dispute about the party logo. The "Old Congress" retained the party symbol of a pair of bullocks carrying a yoke while Indira's breakaway faction were given a new symbol of a cow with suckling calf by the Election Commission as the party election symbol. The split occurred when, in 1969, a united opposition under the banner of Samyukt Vidhayak Dal, won control over several states in the Hindi belt. In the mid-term parliamentary elections held in 1971, the Gandhi-led Congress (R) Party won a landslide victory on a platform of progressive policies such as the elimination of poverty (Garibi Hatao). The policies of the Congress (R) Party under Gandhi before the 1971 elections included proposals to abolish the Privy Purse to former rulers of the Princely states, and the 1969 nationalisation of India's 14 largest banks. Indira Gandhi, second-longest-serving Prime Minister of India and the only woman to hold the office. The New Congress Party's popular support began to wane in the mid-1970s. From 1975, Gandhi's government grew increasingly more authoritarian and unrest among the opposition grew. On 12 June 1975, the High Court of Allahabad declared Indira Gandhi's election to the Lok Sabha, the lower house of India's parliament, void on the grounds of electoral malpractice. However, Gandhi rejected calls to resign and announced plans to appeal to the Supreme Court. She moved to restore order by ordering the arrest of most of the opposition participating in the unrest. In response to increasing disorder and lawlessness, Gandhi's cabinet and government recommended that President Fakhruddin Ali Ahmed declare a State of Emergency, which he did on 25 June 1975 based on the provisions of Article 352 of the Constitution. During the nineteen-month emergency, widespread oppression and abuse of power by Gandhi's unelected younger son and political heir Sanjay Gandhi and his close associates occurred. This period of oppression ended on 23 January 1977, when Gandhi released all political prisoners and called fresh elections for the Lok Sabha to be held in March. The Emergency officially ended on 23 March 1977. In that month's parliamentary elections, the opposition Janata Party won a landslide victory over Congress, winning 295 seats in the Lok Sabha against Congress' 153. Gandhi lost her seat to her Janata opponent Raj Narain. On 2 January 1978, she and her followers seceded and formed a new opposition party, popularly called Congress (I)—the I signifying Indira. During the next year, her new party attracted enough members of the legislature to become the official opposition. In November 1978, Gandhi regained a parliamentary seat. In January 1980, following a landslide victory for Congress (I), she was again elected prime minister. The national election commission declared Congress (I) to be the real Indian National Congress for the 1984 general election.However, the designation I was only dropped in 1996. During Gandhi's new term as prime minister, her youngest son Sanjay died in an aeroplane crash in June 1980. This led her to encourage her elder son Rajiv, who was working as a pilot, to enter politics. Gradually, Indira Gandhi's politics and outlook grew more authoritarian and autocratic, and she became the central figure within the Congress Party. As prime minister, she became known for her political ruthlessness and unprecedented centralization of power. Gandhi's term as prime minister also saw increasing turmoil in Punjab, with demands for Sikh autonomy by Jarnail Singh Bhindranwale and his militant followers. In 1983, they headquartered themselves in the Golden Temple in Amritsar and started accumulating weapons. In June 1984, after several futile negotiations, Gandhi ordered the Indian Army to enter the Golden Temple to establish control over the complex and remove Bhindranwale and his armed followers. This event is known as Operation Blue Star. On 31 October 1984, two of Gandhi's bodyguards, Satwant Singh and Beant Singh, shot her with their service weapons in the garden of the prime minister's residence in response to her authorisation of Operation Blue Star. Gandhi was due to be interviewed by British actor Peter Ustinov, who was filming a documentary for Irish television. Her assassination prompted the 1984 anti-Sikh riots, during which more than 3,000 people were killed. In 1984, Indira Gandhi's son Rajiv Gandhi became nominal head of Congress, and went on to become prime minister upon her assassination. In December, he led Congress to a landslide victory, where it secured 401 seats in the legislature. His administration took measures to reform the government bureaucracy and liberalise the country's economy. Rajiv Gandhi's attempts to discourage separatist movements in Punjab and Kashmir backfired. After his government became embroiled in several financial scandals, his leadership became increasingly ineffectual. Gandhi was regarded as a non-abrasive person who consulted other party members and refrained from hasty decisions. The Bofors scandal damaged his reputation as an honest politician, but he was posthumously cleared of bribery allegations in 2004. On 21 May 1991, Gandhi was killed by a bomb concealed in a basket of flowers carried by a woman associated with the Tamil Tigers. He was campaigning in Tamil Nadu for upcoming parliamentary elections. In 1998, an Indian court convicted 26 people in the conspiracy to assassinate Gandhi. The conspirators, who consisted of Tamil militants from Sri Lanka and their Indian allies, had sought revenge against Gandhi because the Indian troops he sent to Sri Lanka in 1987 to help enforce a peace accord there had fought with Tamil separatist guerrillas. P. V. Narasimha Rao served as the tenth Prime Minister of India (1991–1996). He was the first prime minister from South India. Rajiv Gandhi was succeeded as party leader by P. V. Narasimha Rao, who was elected prime minister in June 1991. His rise to the prime ministership was politically significant because he was the first holder of the office from South India. His administration oversaw major economic change and experienced several home incidents that affected India's national security. Rao, who held the Industries portfolio, was personally responsible for the dismantling of the Licence Raj, which came under the purview of the Ministry of Commerce and Industry. He is often called the "father of Indian economic reforms". Future prime ministers Atal Bihari Vajpayee and Manmohan Singh continued the economic reform policies begun by Rao's government. Rao accelerated the dismantling of the Licence Raj, reversing the socialist policies of previous governments. He employed Manmohan Singh as his finance minister to begin a historic economic change. With Rao's mandate, Singh launched India's globalisation reforms that involved implementing International Monetary Fund (IMF) policies to prevent India's impending economic collapse. Rao was also referred to as Chanakya for his ability to push tough economic and political legislation through the parliament while he headed a minority government. By 1996, the party's image was suffering from allegations of corruption, and in elections that year, Congress was reduced to 140 seats, its lowest number in the Lok Sabha to that point. Rao later resigned as prime minister and, in September, as party president. He was succeeded as president by Sitaram Kesri, the party's first non-Brahmin leader. During the tenure of both Rao and Kesri, the two leaders conducted internal elections to the Congress working committees and their own posts as party presidents. Manmohan Singh served as the 13th Prime Minister of India between 2004 and 2014. The 1998 general election saw Congress win 141 seats in the Lok Sabha, its lowest tally until then. To boost its popularity and improve its performance in the forthcoming election, Congress leaders urged Sonia Gandhi, Rajiv Gandhi's widow, to assume leadership of the party. She had previously declined offers to become actively involved in party affairs, and had stayed away from politics. After her election as party leader, a section of the party that objected to the choice because of her Italian ethnicity broke away and formed the Nationalist Congress Party (NCP), led by Sharad Pawar. The breakaway faction commanded strong support in the state of Maharashtra and limited support elsewhere. The remainder continued to be known as the Indian National Congress. Sonia Gandhi struggled to revive the party in her early years as its president; she was under continuous scrutiny for her foreign birth and lack of political acumen. In the snap elections called by the National Democratic Alliance (NDA) government in 1999, Congress' tally further plummeted to just 114 seats. Although the leadership structure was unaltered as the party campaigned strongly in the assembly elections that followed, Gandhi began to make such strategic changes as abandoning the party's 1998 Pachmarhi resolution of ekla chalo, or "go it alone" policy, and formed alliances with other like-minded parties. In the intervening years, the party was successful at various legislative assembly elections; at one point, Congress ruled 15 states. For the 2004 general election, Congress forged alliances with regional parties including the NCP and the Dravida Munnetra Kazhagam. The party's campaign emphasised social inclusion and the welfare of the common masses—an ideology that Gandhi herself endorsed for Congress during her presidency—with slogans such as Congress ka haath, aam aadmi ke saath ("Congress hand in hand with the common man"), contrasting with the NDA's "India Shining" campaign. The Congress-led United Progressive Alliance (UPA) won 222 seats in the new parliament, defeating the NDA by a substantial margin. With the subsequent support of the communist front, Congress won a majority and formed a new government. Despite massive support from within the party, Gandhi declined the post of prime minister, choosing to appoint Manmohan Singh instead. She remained as party president and headed the National Advisory Council (NAC). During its first term in office, the UPA government passed several social reform bills. These included an employment guarantee bill, the Right to Information Act, and a right to education act. The NAC, as well as the Left Front that supported the government from the outside, were widely seen as being the driving force behind such legislation. The Left Front withdrew its support of the government over disagreements about the U.S.–India Civil Nuclear Agreement. Despite the effective loss of 62 seats in parliament, the government survived the trust vote that followed. In the Lok Sabha elections held soon after, Congress won 207 seats, the highest tally of any party since 1991. The UPA as a whole won 262, enabling it to form a government for the second time. The social welfare policies of the first UPA government, and the perceived divisiveness of the BJP, are broadly credited with the victory. By the 2014 Lok Sabha elections, the party had lost much of its popular support, mainly because of several years of poor economic conditions in the country, and growing discontent over a series of corruption allegations involving government officials, including the 2G spectrum case and the Indian coal allocation scam. Congress won only 44 seats, which was its worst-ever performance in a national election and brought into question whether it would continue to be identified as an officially recognized party. Gandhi retired as party president in December 2017, having served for a record nineteen years. She was succeeded by her son Rahul Gandhi. As of 2014[update], the election symbol of Congress, as approved by the Election Commission of India, is an image of a right hand with its palm facing front and its fingers pressed together; this is usually shown in the centre of a tricolor flag. The hand symbol was first used by Indira Gandhi when she split from the Congress (R) faction following the 1977 elections and created the New Congress (I). The symbol of the original Congress during elections held between 1952 and 1971 was an image of two bullocks with a plough. The symbol of Indira's Congress (R) during the 1971–1977 period was a cow with a suckling calf. Congress was structured in a hierarchical manner by Mohandas Gandhi's when he took charge as the president of the party in 1921. The party was a "broad church" during the independence movement; however, Jawarlal Nehru's descendants have turned the party into a "family firm" with hereditary succession. At present, the president and the All India Congress Committee (AICC) are elected by delegates from state and district parties at an annual national conference; in every Indian state and union territory—or pradesh—there is a Pradesh Congress Committee (PCC), which is the state-level unit of the party responsible for directing political campaigns at local and state levels, and assisting the campaigns for parliamentary constituencies. Each PCC has a working committee of twenty members, most of whom are appointed by the party president, the leader of the state party, who is chosen by the national president. Those elected as members of the states' legislative assemblies form the Congress Legislature Parties in the various state assemblies; their chairperson is usually the party's nominee for Chief Ministership. The party is also organised into various committees, and sections; it publishes a daily newspaper, the National Herald. Despite being a party with a structure, Congress under Indira Gandhi did not hold any organizational elections after 1972. The AICC is composed of delegates sent from the PCCs. The delegates elect Congress committees, including the Congress Working Committee, consisting of senior party leaders and office bearers. The AICC takes all important executive and political decisions. Since Indira Gandhi formed Congress (I) in 1978, the President of the Indian National Congress has effectively been: the party's national leader, head of the organisation, head of the Working Committee and all chief Congress committees, chief spokesman, and Congress' choice for Prime Minister of India. Constitutionally, the president is elected by the PCCs and members of the AICC; however, this procedure has often been by-passed by the Working Committee, which has elected its own candidate. The Congress Parliamentary Party (CPP) consists of elected MPs in the Lok Sabha and Rajya Sabha. There is also a Congress Legislative Party (CLP) leader in each state. The CLP consists of all Congress Members of the Legislative Assembly (MLAs) in each state. In cases of states where the Congress is single-handedly ruling the government, the CLP leader is the Chief Minister. Other directly affiliated groups include: the National Students Union of India (NSUI), the Indian Youth Congress — the party's youth wing, the Indian National Trade Union Congress, Mahila Congress, its women's division, and Congress Seva Dal—its voluntary organisation. Dynasticism is fairly common in many political parties in India, including the Congress party. Six members of the Nehru-Gandhi family have been presidents of the party. The party started turning into a family firm controlled by Indira Gandhi's family during the emergency. This was characterized by servility and sycophancy towards the family which later turned into hereditary succession of Gandhi family members to power. Since the formation of Congress(I) by Indira Gandhi in 1978,the party president has been from her family except for the period between 1991 and 1998. In the last three elections to the Lok Sabha combined, 37% of Congress party MPs had family members precede them in politics. Congress is a civic nationalist party that follows a form of nationalism that supports the values of freedom, tolerance, equality, and individual rights. Throughout much of the Cold War period, Congress supported a foreign policy of nonalignment that called for India to form ties with both the Western and Eastern Blocs, but to avoid formal alliances with either. support for Pakistan led the party to endorse a friendship treaty with the Soviet Union in 1971. In 2004, when the Congress-led United Progressive Alliance came to power, its chairperson Sonia Gandhi unexpectedly relinquished the premiership to Manmohan Singh. This Singh-led "UPA I" government executed several key pieces of legislation and projects, including the Rural Health Mission, Unique Identification Authority, the Rural Employment Guarantee scheme, and the Right to Information Act. The history of economic policy of Congress-led governments can be divided into two periods. The first period lasted from independence, in 1947, to 1991 and put great emphasis on the public sector. The second period began with economic liberalization in 1991. At the beginning of the first period, the Congress prime minister Jawaharlal Nehru implemented policies based on import substitution industrialization and advocated a mixed economy where the government-controlled public sector would co-exist with the private sector. He believed that the establishment of basic and heavy industry was fundamental to the development and modernisation of the Indian economy. The government, therefore, directed investment primarily into key public-sector industries—steel, iron, coal, and power—promoting their development with subsidies and protectionist policies. This period was called the Licence Raj, or Permit Raj, which was the elaborate system of licences, regulations, and accompanying red tape that were required to set up and run businesses in India between 1947 and 1990. The Licence Raj was a result of Nehru and his successors' desire to have a planned economy where all aspects of the economy were controlled by the state, and licences were given to a select few. Up to 80 government agencies had to be satisfied before private companies could produce something; and, if the licence were granted, the government would regulate production. The licence raj system continued under Indira Gandhi.In addition, many key sectors such as banking, steel coal, and oil were nationalized. Under Rajiv Gandhi, small steps were taken to liberalize the economy. In 1991, the new Congress-party government, led by P. V. Narasimha Rao, initiated reforms to avert the impending 1991 economic crisis. The reforms progressed furthest in opening up areas to foreign investment, reforming capital markets, deregulating domestic business, and reforming the trade regime. The goals of Rao's government were to reduce the fiscal deficit, privatize the public sector, and increase investment in infrastructure. Trade reforms and changes in the regulation of foreign direct investment were introduced in order to open India to foreign trade while stabilising external loans. Rao chose Manmohan Singh for the job. Singh, an acclaimed economist and former chairman of the Resrve Bank, played a central role in implementing these reforms. In 2004, Singh became prime minister of the Congress-led UPA government. Singh remained prime minister after the UPA won the 2009 general elections. The UPA government introduced policies aimed at reforming the banking and financial sectors, as well as public sector companies. It also introduced policies aimed at relieving farmers of their debt. In 2005, Singh's government introduced the value added tax, replacing the sales tax. India was able to resist the worst effects of the global Economic crisis of 2008. Singh's government continued the Golden Quadrilateral, the Indian highway modernisation program that was initiated by Vajpayee's government. At present, Congress endorses a mixed economy in which the private sector and the state both direct the economy, which has characteristics of both market and planned economies. Congress advocates import substitution industrialisation—the replacement of foreign imports with domestic products. Congress believes the Indian economy should be liberalised to increase the pace of development. In 2005, the Congress-led government started the National Rural Health Mission, which employed about 500,000 community health workers. It was praised by economist Jeffrey Sachs. In 2006, it implemented a proposal to reserve 27% of seats in the All India Institute of Medical Studies (AIIMS), the Indian Institutes of Technology (IITs), the Indian Institutes of Management (IIMs), and other central higher education institutions, for Other Backward Classes, which led to the 2006 Indian anti-reservation protests. The Singh government also continued the Sarva Shiksha Abhiyan programme, which includes the introduction and improvement of mid-day school meals and the opening of new schools throughout India, especially in rural areas, to fight illiteracy. During Manmohan Singh's prime-ministership, eight Institutes of Technology were opened in the states of Andhra Pradesh, Bihar, Gujarat, Orissa, Punjab, Madhya Pradesh, Rajasthan, and Himachal Pradesh. Congress has strengthened anti-terrorism laws with amendments to the Unlawful Activities (Prevention) Act (UAPA). The National Investigation Agency (NIA) was created by the UPA government soon after the November 2008 Mumbai terror attacks, in response to the need for a central agency to combat terrorism. The Unique Identification Authority of India was established in February 2009 to implement the proposed Multipurpose National Identity Card, with the objective of increasing national security. Congress has continued the foreign policy started by P. V. Narasimha Rao. This includes the peace process with Pakistan, and the exchange of high-level visits by leaders from both countries. The party has tried to end the border dispute with the People's Republic of China through negotiations. Relations with Afghanistan have also been a concern for Congress. During Afghan President Hamid Karzai's visit to New Delhi in August 2008, Manmohan Singh increased the aid package to Afghanistan for the development of schools, health clinics, infrastructure, and defence. India is now one of the single largest aid donors to Afghanistan. When in power between 2004 and 2014, Congress worked on India's relationship with the United States. Prime Minister Manmohan Singh visited the US in July 2005 to negotiate an India–United States Civil Nuclear Agreement. US president George W. Bush visited India in March 2006; during this visit, a nuclear agreement that would give India access to nuclear fuel and technology in exchange for the IAEA inspection of its civil nuclear reactors was proposed. Over two years of negotiations, followed by approval from the IAEA, the Nuclear Suppliers Group and the United States Congress, the agreement was signed on 10 October 2008. Congress' policy has been to cultivate friendly relations with Japan as well as European Union countries including the United Kingdom, France, and Germany. Diplomatic relations with Iran have continued, and negotiations over the Iran-Pakistan-India gas pipeline have taken place. In April 2006, New Delhi hosted an India–Africa summit attended by the leaders of 15 African states. Congress' policy has also been to improve relations with other developing countries, particularly Brazil and South Africa. As of December 2018[update], Congress (INC) is in power in the states of Punjab, Chhattisgarh, Rajasthan and Madhya Pradesh where the party has majority support. In Karnataka and Puducherry it shares power with alliance partner Janata Dal (Secular) and Dravida Munnetra Kazhagam respectively. The party during the post-independence era has governed most of the States and union territories of India. A majority of non-Congress prime ministers of India had been members of the Congress party earlier in their careers. ^ "The first modern nationalist movement to arise in the non-European empire, and one that became an inspiration for many others, was the Indian Congress." ^ "South Asian parties include several of the oldest in the post-colonial world, foremost among them the 129-year-old Indian National Congress that led India to independence in 1947"
^ "The organization that led India to independence, the Indian National Congress, was established in 1885." ^ "... anti-colonial movements ... which, like many other nationalist movements elsewhere in the empire, were strongly infuenced by the Indian National Congress." ^ "During the first five decades of India's independence, the left-of-center, secular Indian National Congress (INC) and its factions have ruled almost continuously ... While the Hindu nationalist Bharatiya Janata Party (BJP) ..."
^ "A day before Rahul takes over, Sonia says she'll retire". The Hindu. 16 December 2017. Retrieved 17 December 2017. ^ Economy hidden Jun 02, 2014 19:21:53 IST (2 June 2014). "Mallikarjun Kharge will be Congress leader in Lok Sabha". Firstpost. Retrieved 16 August 2018. ^ Politics hidden Jun 08, 2014 20:54:01 IST (8 June 2014). "Ghulam Nabi Azad named Congress party leader in Rajya Sabha". Firstpost. Retrieved 16 August 2018. ^ "Rent relief unlikely for Congress's Delhi properties | India News - Times of India". M.timesofindia.com. Retrieved 16 August 2018. ^ "Indian National Congress - Policy and structure". Encyclopædia Britannica. Retrieved 17 November 2014. ^ a b c d e f "National Parties: Indian National Congress". Indian Mapped. Retrieved 18 April 2019. ^ a b c d e "Indian National Congress (INC)". Elections.in. Retrieved 18 April 2019. ^ "Lok Sabha Elections 2014: Know your party symbols!". Daily News and Analysis. 10 April 2014. ^ Saez, Lawrence; Sinha, Aseema (2010). "Political cycles, political institutions and public expenditure in India, 1980–2000". British Journal of Political Science. 40 (1): 91–113. doi:10.1017/s0007123409990226. ^ "Progressive Alliance Participants". Progressive Alliance. Archived from the original on 2 March 2015. Retrieved 20 March 2016. ^ "Full Member Parties of Socialist International". Socialist International. ^ "India General (Lok Sabha) Election 2014 Results". mapsofindia.com. ^ "Election Results India, General Elections Results, Lok Sabha Polls Results India - IBNLive". in.com. Archived from the original on 20 April 2015. ^ "List of Political Parties and Election Symbols main Notification Dated 18.01.2013" (PDF). India: Election Commission of India. 2013. Retrieved 9 May 2013. ^ "STRENGTHWISE PARTY POSITION IN THE RAJYA SABHA". Rajya Sabha. Retrieved 14 July 2018. ^ "Indian National Congress". Encyclopædia Britannica. Retrieved 26 February 2018. ^ "Information about the Indian National Congress". www.open.ac.uk. Arts & Humanities Research council. Retrieved 29 July 2015. ^ "Indian National Congress – about INC, history, symbol, leaders and more". Elections.in. 7 February 2014. Retrieved 3 May 2014. ^ Sahasrabuddhe, Vinay (8 August 2016). "In Decline Mode, Congress Struggles With a 'Crisis of Purpose'". The Quint. Retrieved 17 December 2017. ^ "Indian National Congress". Times of India. 9 February 2017. Retrieved 27 July 2018. ^ "Indian National Congress, Political Party, India". Encyclopaedia Britannica. ... broadly based political party of India. Formed in 1885, the Indian National Congress dominated the Indian movement for independence from Great Britain. It subsequently formed most of India's governments from the time of independence and often had a strong presence in many state governments. ^ a b Jigyasu Intoday (28 December 2017). 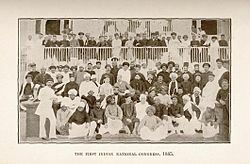 "On this day in 1885, Indian National Congress was formed: 12 facts about one of the oldest political parties of the country - Education Today News". Indiatoday.in. Retrieved 16 August 2018. ^ "The long march to freedom - IN SCHOOL". The Hindu. 16 August 2016. Retrieved 16 August 2018. ^ "Full text of "The History Of The India National Congress"". Retrieved 16 August 2018. ^ Pattabhi Sita Ramaiah (1 November 2018). "The History Of The Indian National Congress(1885-1935)" – via Internet Archive. ^ Singh, Kanishka (5 December 2017). "Indian National Congress: From 1885 till 2017, a brief history of past presidents". The Indian Express. Retrieved 16 August 2018. ^ "Sonia sings Vande Mataram at Congress function - Rediff.com India News". M.rediff.com. 28 December 2006. Retrieved 16 August 2018. ^ Sitaramayya, B. Pattabhi (1935). The history of the Indian National Congress (1885–1935). Working Committee of the Congress. pp. 12–27. ^ a b Walsh, Judith E. (2006). A Brief History of India. Infobase Publishing. p. 154. ISBN 9781438108254. ^ Richard Sisson; Stanley A. Wolpert (1988). Congress and Indian Nationalism: The Pre-independence Phase. University of California Press. pp. 22–23. ISBN 978-0-520-06041-8. Without any funds or any secretariat, however (other than Hume) Congress remained, during its first decade at least, more of a sounding board for elite Indian aspirations than a political party. ^ a b Mahatma Gandhi (1994). The Gandhi Reader: A Sourcebook of His Life and Writings. Grove Press. p. 254. ISBN 9780802131614. ^ Minault, Gail (1982). The Khilafat Movement: Religious Symbolism and Political Mobilization in India - Gail Minault - Google Books. ISBN 9780231050722. Retrieved 16 August 2018. ^ Agrawal, Lion M. G. (2008). Freedom fighters of India. Gyan Publishing House. p. 121. ISBN 9788182054721. ^ "Main Bharat Hun". Main Bharat Hun. Archived from the original on 21 July 2010. Retrieved 3 May 2014. ^ S. M. Ikram (1995). Indian Muslims and Partition of India. Atlantic Publishers. p. 240. ISBN 9788171563746. ^ SN Sen (2006). History Modern India. New Age International. p. 202. ISBN 9788122417746. ^ Dates of time spent in Britain: 1919–21. "Subhas Chandra Bose |". Open.ac.uk. Retrieved 3 May 2014. ^ Rudolph, Lloyd I.; Hoeber Rudolph, Susanne (2008). Explaining Indian Democracy: The realm of institutions: state formation and institutional change. Oxford University Press; Original from: University of California Press. p. 58. ISBN 978-0-19-569365-2. ^ Ghose, Sankar (1975). Political ideas and movements in India. Allied Publishers; Original from: University of Michigan Press. p. 136. ^ "Lawyers in the Indian Freedom Movement – The Bar Council of India". Barcouncilofindia.org. Retrieved 3 May 2014. ^ Sharma, Manimugdha S (10 May 2017). "Royal Indian Navy Mutiny: Historian remembers last secular uprising of India". The Times of India. Retrieved 6 June 2018. ^ Raghavan, Srinath (3 April 2017). "Revisiting the 1946 Royal Indian Navy mutiny". Livemint. Retrieved 6 June 2018. ^ 1:48 pm. "New year aspirations — Can India hope for a centrist progressive liberal party?". Blogs.timesofindia.indiatimes.com. Retrieved 16 August 2018. ^ "Why India's opposition is nearly irrelevant". The Economist. 28 April 2017. Retrieved 6 June 2018. ^ a b George McTurnan Kahin, Harold C. Hinton (1958). Major governments of Asia. Cornell University Press. p. 439. ^ Moshe Y. Sachs (1967). Worldmark Encyclopedia of the Nations: Asia and Australasia. Worldmark Press. ^ Richard Sisson, Leo E. Rose (1991). War and Secession: Pakistan, India and the Creation of Bangladesh. University of California Press. pp. 1–15. ISBN 978-0-520-07665-5. ^ a b "Nehru Years in Indian Politics" (PDF). sps.ed.ac.uk. School of Social and Political Science, Edinburgh. Retrieved 23 June 2014. ^ a b "Economic Ideology of Jawaharlal Nehru" (PDF). www.epw.in. Economic and Political Weekly. Retrieved 23 June 2014. ^ "History of Indian Economy Part II". Daily News and Analysis. DNA. 11 July 2011. Retrieved 23 June 2014. ^ "Nehru: Founding member of The non-aligned movement". news.bbc.co.uk. The British Broadcasting Corporation. Retrieved 23 June 2014. ^ "History and Evolution of Non-Aligned Movement". mea.gov.in. Ministry of External Affairs,Government of India. Retrieved 23 June 2014. ^ a b c Nayantara Sahgal (1 January 2010). Jawaharlal Nehru: Civilizing a Savage World. Penguin Books India. p. 58. ISBN 978-0-670-08357-2. ^ Nayantara Sahgal (1 January 2010). Jawaharlal Nehru: Civilizing a Savage World. Penguin Books India. p. 60. ISBN 978-0-670-08357-2. ^ Nayantara Sahgal (1 January 2010). Jawaharlal Nehru: Civilizing a Savage World. Penguin Books India. p. 61. ISBN 978-0-670-08357-2. ^ "The death of Nehru". The Guardian. The Guardian archive. The Guardian News Portal. 28 May 2013. Retrieved 23 June 2014. ^ "Jawaharlal Nehru (1889-1964)". bbc.co.uk. The British Broadcasting Corporation. Retrieved 23 June 2014. ^ "1964: Light goes out in India as Nehru dies". news.bbc.co.uk. The British Broadcasting Corporation. Retrieved 23 June 2014. ^ "K. Kamaraj -Life History". www.perunthalaivar.org. The Perun Thalaivar organization. Retrieved 23 June 2014. ^ "The Syndicate: Kingmakers of India". pib.nic.in. Press Information Bureau: Government of India. Retrieved 23 June 2014. ^ Mahendra Prasad Singh (1 January 1981). Split in a Predominant Party: The Indian National Congress in 1969. Abhinav Publications. p. 46. ISBN 978-81-7017-140-9. ^ Bala Jeyaraman (2 September 2013). Kamaraj: The Life and Times of K. Kamaraj. Rupa Publications. pp. 55–56. ISBN 978-81-291-3227-7. ^ N. S. Gehlot (1991). The Congress Party in India: Policies, Culture, Performance. Deep & Deep Publications. p. 180. ISBN 978-81-7100-306-8. ^ Mahendra Prasad Singh (1 January 1981). Split in a Predominant Party: The Indian National Congress in 1969. Abhinav Publications. p. 42. ISBN 978-81-7017-140-9. ^ a b Sanghvi, Vijay (2006). The Congress, Indira to Sonia Gandh. New Delhi: Kalpaz Publications. p. 77. ISBN 978-81-7835-340-1. ^ R. D. Pradhan; Madhav Godbole (1 January 1999). Debacle to Revival: Y. B. Chavan as Defence Minister, 1962–65. Orient Blackswan. p. 17. ISBN 978-81-250-1477-5. ^ Arvind Panagariya Professor of Economics and Jagdish Bhagwati Professor of Indian Political Economy Columbia University School of International & Public Affairs (1 February 2008). India: The Emerging Giant: The Emerging Giant. Oxford University Press. p. 27. ISBN 978-0-19-804299-0. ^ "History and Politics of India". socialsciences.ucla.edu. UCLA Division of Social Sciences. Retrieved 23 June 2014. ^ "Biography of Gulzarilal Nanda". pmindia.gov.in. Prime Minister's Office. Archived from the original on 28 August 2012. Retrieved 23 June 2014. ^ Narayan Agrawal Narayan; Lal Bahadur Shastri; Vivek Misra; Subha Ravi (2006). Lal Bahadur Shastri, Churn of Conscience. Eternal Gandhi. p. 88. ISBN 978-81-231-0193-4. ^ "The White Revolution: A beginning". unicef.org. UNICEF. Retrieved 23 June 2014. ^ Jyotirindra Dasgupta (1970). Language Conflict and National Development: Group Politics and National Language Policy in India. University of California Press. p. 237. ISBN 978-0-520-01590-6. ^ Forrester, Duncan B. (1966). "The Madras anti-Hindi agitation". Pacific Affairs. Digital library of academic journals. 39 (1/2): 19–36. doi:10.2307/2755179. JSTOR 2755179. ^ "The Indo-Pakistan war of 1965". indiannavy.nic.in. Indian Navy. Retrieved 23 June 2014. ^ "Life of Lal Bahadur Shastri". Business Standard. Ananda Publishers. Ananda Bazar Patrika (ABP) Group. 26 March 2013. Retrieved 23 June 2014. ^ "Controversial death of Shastri". wikileaks-forum.com. Wikileaks Forum. Archived from the original on 1 May 2014. Retrieved 23 June 2014. ^ "Lal Bahadur Shastri's death in Tashkent". bbc.com. BBC. Retrieved 23 June 2014. ^ "Lal Bahadur Shastri". socialsciences.ucla.edu/. UCLA Division of Social Science. Retrieved 23 June 2014. ^ Singh, M.P., 1981. Split in a Predominant Party: The Indian National Congress in 1969. Abhinav Publications, pp.65-80. ^ Hardgrave, R. L., 1970. "The Congress in India: Crisis and Split". Asian Survey, 10(3), pp. 256-262. ^ "March to socialism under Prime Minister Indira Gandhi". The Economic Times. The Times Group. Bennett, Coleman & Co. Ltd. 24 August 2011. ^ "1969: S. Nijalingappa expelled Indira Gandhi from the Party". India Today. Aroon Purie. 2 July 2007. Retrieved 25 June 2014. ^ a b Rosser, J. Barkley; Rosser, Marina V. (2004). Comparative Economics in Transforming the World Economy. MIT Press. pp. 468–470. ISBN 978-0262182348. ^ "General Elections, India, 1971: Statistical report" (PDF). eci.nic.in. Election Commission of India. Archived from the original (PDF) on 18 July 2014. Retrieved 25 June 2014. ^ "Economic Milestone: Nationalisation of Banks (1969)". Forbes India. Forbes. 17 September 2015. Retrieved 17 September 2015. ^ "The Emergency, and Indian democracy". sscnet.ucla.edu. UCLA Division of Social Science. Retrieved 25 June 2014. ^ "Emergency papers found". The Times of India. 30 June 2013. Retrieved 6 June 2018. ^ Ghildiyal, Subodh (29 December 2010). "Cong blames Sanjay Gandhi for Emergency 'excesses'". The Times of India. Retrieved 30 January 2014. ^ Express News Service (11 June 2013). "Emergency 'propagandist' who banned Kishore Kumar songs". Indian Express. Retrieved 17 January 2014. ^ Dasgupta, Swapan (July 1985). "The Life of Indira Gandhi". Book Reviews. Third World Quarterly. 7 (3): 731–778. doi:10.1080/01436598508419863. ^ "Indian general election, 1977" (PDF). ipu.org. Inter-Parliamentary Union. Retrieved 25 June 2014. ^ Inder Malhotra (23 June 2010). "What Prime Minister Indira Gandhi's Emergency proved for India". Rediff.com. Retrieved 25 June 2014. ^ Basu, Manisha (2016). The Rhetoric of Hindutva. Cambridge University Press. ISBN 9781107149878. ^ "Statistical report general elections, 1980" (PDF). eci.nic.in. Election Commission of India. Archived from the original (PDF) on 18 July 2014. Retrieved 25 June 2014. ^ Manisha Basu (2 November 2016). The Rhetoric of Hindutva. Cambridge University Press. pp. 73–. ISBN 978-1-107-14987-8. ^ Statistical Report on General Elections, 1980 to the Seventh Lok Sabha (PDF). New Delhi: Election Commission of India. p. 1. Archived from the original (PDF) on 18 July 2014. Retrieved 9 June 2016. ^ "Postindependence: from dominance to decline". Britannica.com. Britannica Portal. Retrieved 24 June 2014. ^ "The life and death of Sanjay Gandhi". The Hindu. N.Ram. The Hindu Group. 19 February 2013. Retrieved 25 June 2014. ^ "Sanjay Gandhi dies in plane crash". The Sydney Morning Herald. Google News. 24 June 1980. Retrieved 25 June 2014. ^ "PM Modi remembers Indira Gandhi on her birth anniversary". The Week. 19 November 2017. Retrieved 6 June 2018. ^ "Operation Blue Star 1984". Daily News and Analysis. Deepak Rathi. Dainik Bhaskar. 6 June 2014. Retrieved 25 June 2014. ^ a b "1984: Operation Blue Star". The Daily Telegraph. 6 June 2014. Retrieved 25 June 2014. ^ "Operation Blue Star". The Hindu. 10 June 2013. Retrieved 25 June 2014. ^ "1984: Indian prime minister shot dead". BBC News. 31 October 1984. Retrieved 23 June 2014. ^ "Violence follows Gandhi killing". BBC News. Retrieved 23 June 2014. ^ "Prime Minister Rajiv Gandhi, complete profile". pmindia.gov.in. Prime Minister's Office. Archived from the original on 1 September 2012. Retrieved 23 June 2014. ^ "India General or the 8th Lok Sabha Election Results - 1984". Retrieved 23 June 2014. ^ "Resurgent India". Daily News and Analysis. 22 January 2014. Retrieved 23 June 2014. ^ "Rajiv Gandhi and the story of Indian modernization". Mint. Retrieved 23 June 2014. ^ "Rajiv Gandhi, History and Politics". UCLA, Division of Social Sciences. Retrieved 23 June 2014. ^ "Rajiv Gandhi cleared over bribery". BBC News. 4 February 2004. Retrieved 7 March 2010. ^ NDTV India. "The assassination of Rajiv Gandhi". Retrieved 21 June 2014. ^ "Rajiv Gandhi assassination case". The Times of India. 27 February 2014. Retrieved 21 June 2014. ^ D. R. Kaarthikenyan, Radhavinod Raju; Radhavinod Raju (2008). Rajiv Gandhi Assassination. Sterling Publishers Pvt. Ltd. pp. 89–91. ISBN 978-81-207-3265-0. ^ "SC refers Rajiv Gandhi killers' release case to Constitution Bench". The Indian Express. 25 April 2014. Retrieved 21 June 2014. ^ "PV Narasimha Rao Biography". Website of the Prime Minister of India. Archived from the original on 27 December 2012. Retrieved 23 June 2014. ^ "Narasimha Rao – a Reforming PM". BBC News (23 December 2004). Retrieved 2 March 2007. ^ a b Arvind Kumar, Arun Narendhranath (3 October 2001). "India must embrace unfettered free enterprise". Daily News and Analysis. ^ a b "Narasimha Rao led India at crucial juncture, was father of economic reform: Pranab". 31 December 2012. Retrieved 25 January 2013. ^ "PV Narasimha Rao reinvented India". The National. Abu Dhabi. Retrieved 23 June 2014. ^ "Foreign Policies of India's Prime Ministers" (PDF). Transnational Organization. Retrieved 23 June 2014. ^ ABP News. "Atal Bihari Vajpayee's 13-day govt". YouTube. Retrieved 24 June 2014. ^ "The Sitaram Kesri case". Daily News and Analysis. 10 July 2011. Retrieved 23 June 2014. ^ Subrata Kumar Mitra; Mike Enskat; Clemens Spiess (2004). Political Parties in South Asia. Greenwood Publishing Group. pp. 42–43. ISBN 978-0-275-96832-8. ^ "India Parliamentary Chamber: Lok Sabha". Inter-Parliamentary Union. Retrieved 4 March 2018. ^ "Nationalist Congress Party". Britannica. Retrieved 4 March 2018. ^ a b Negi, Saroj (16 December 2017). "Sonia Gandhi's Legacy: She Reinvented Herself to Fight Off Challenges but also Had Her Share of Failures". India Today. Retrieved 2 March 2018. ^ Naqshbandi, Aurangzeb (4 March 2018). "Sonia Gandhi's 19 years as Congress president: From husband death to son Rahul's elevation". Hindustan Times. Retrieved 16 December 2017. ^ "The mathematics of politics". Rediff.com. 16 May 2004. Retrieved 4 March 2018. ^ "Sonia Gandhi retires as Congress president, to remain active in politics". The Indian Express. 15 December 2017. Retrieved 15 December 2017. ^ Chowdhary, Neerja (16 December 2017). "As Sonia Gandhi makes way". The Indian Express. Retrieved 19 December 2017. ^ a b Naqshbandi, Aurangzeb (16 December 2017). "Sonia Gandhi's 19 years as Congress president: From husband Rajiv's death to son Rahul's elevation". Hindustan Times. Retrieved 20 December 2017. ^ Chandra, Rina (14 April 2009). "Sonia Gandhi keeps Congress hopes alive in India polls". Reuters. Retrieved 19 December 2017. ^ Mathew, Liz (30 March 2010). "Hands-on influence for Sonia Gandhi as NAC head". Livemint. Retrieved 17 August 2016. ^ "Manmohan survives trust vote". India Today. Retrieved 6 January 2014. ^ Bidwai, Praful. "Reading the Verdict". Frontline. Retrieved 6 January 2014. ^ "2G spectrum scam". India Today. 19 October 2012. Retrieved 22 June 2014. ^ "Coal Block Allocations Scam". Daily News and Analysis. 30 April 2013. Retrieved 22 June 2014. ^ "List of Congress winners". CNN-IBN. 17 May 2014. Retrieved 22 June 2014. ^ "Congress Vote Share Dips Below 20 Per Cent for First Time". NDTV India. 17 May 2014. Retrieved 22 June 2014. ^ "A Short History of the Congress Hand". The Wall Street Journal. News Corp. Dow Jones & Company. 28 March 2012. Retrieved 27 June 2014. ^ "How Indira's Congress got its hand symbol". NDTV. 22 December 2010. Retrieved 27 June 2014. ^ "Indian political party election symbols from 1951". CNN-IBN. 4 April 2014. Retrieved 27 June 2014. ^ Sanghvi, Vijay (2006). The Congress, Indira to Sonia Gandh. New Delhi: Kalpaz Publications. p. 77. ISBN 978-81-7835-340-1. ^ "Two Lessons From India's Greatest Leader - Gandhi". Forbes.com. Retrieved 16 August 2018. ^ a b Sumantra Bose (16 September 2013). Transforming India. Harvard University Press. pp. 28–29. ISBN 978-0-674-72819-6. ^ Meghnad Desai (2007). "Gandhi & Gandhi". India International Centre Quarterly. 34 (2): 59. JSTOR 23006304. ^ Sunita Aron (1 April 2016). The Dynasty: Born to Rule. Hay House, Inc. ISBN 978-93-85827-10-5. ^ "The Past And Future of the Indian National Congress". The Caravan. March 2010. Retrieved 6 June 2018 – via Ramachandra Guha. ^ a b c Kedar Nath Kumar (1 January 1990). Political Parties in India, Their Ideology and Organisation. Mittal Publications. pp. 41–43. ISBN 978-81-7099-205-9. ^ Sanghvi, Vijay (2006). The Congress Indira to Sonia Gandhi. Delhi: Kalpaz Publications. p. 128. ISBN 978-8178353401. Retrieved 4 November 2016. ^ "All India 2014 Results". Political Baba. ^ "Lok Sabha Election 2014 Analysis, Infographics, Election 2014 Map, Election 2014 Charts". Firstpost. Archived from the original on 24 September 2015. ^ Simon Denyer (24 June 2014). Rogue Elephant: Harnessing the Power of India's Unruly Democracy. Bloomsbury USA. pp. 115–116. ISBN 978-1-62040-608-3. ^ Adam Ziegfeld (28 April 2016). Kanchan Chandra (ed.). Democratic Dynasties: State, Party and Family in Contemporary Indian Politics. Cambridge University Press. p. 105. ISBN 978-1-107-12344-1. ^ N. S. Gehlot (1991). The Congress Party in India: Policies, Culture, Performance. Deep & Deep Publications. p. 177. ISBN 978-81-7100-306-8. ^ "Non-Aligned Movement: Jawaharlal Nehru – The architect of India's foreign policy | India News - Times of India". Timesofindia.indiatimes.com. 20 May 2017. Retrieved 16 August 2018. ^ 11:36 pm. "The Indo-Pak war 1965 and the Tashkent agreement: Role of external powers". Blogs.timesofindia.indiatimes.com. Retrieved 16 August 2018. ^ "The Manmohan Singh legacy: Key achievements and failures". The Indian Express. Retrieved 16 August 2018. ^ "Highlights Of UPA Achievements In 10 Years - Indiatimes.com". M.indiatimes.com. 3 January 2014. Retrieved 16 August 2018. ^ "India: the economy". BBC. 1998. ^ Kapila, Raj; Kapila, Uma (2004). Understanding India's economic Reforms. Academic Foundation. p. 126. ISBN 978-8171881055. ^ "Unequal effects of Liberalisation – Dismantling the license raj in India" (PDF). ^ "Banking on reform". Indian Express. Retrieved 14 June 2013. ^ "Farmer Waiver Scheme- PM statement". PIB. Retrieved 14 June 2013. ^ Mohan, R., 2008. Global financial crisis and key risks: impact on India and Asia. RBI Bulletin, pp.2003-2022. ^ Kevin Plumberg; Steven C. Johnson (2 November 2008). "Global inflation climbs to historic levels". The New York Times. Retrieved 17 June 2011. ^ "Economic benefits of golden Quadilateral". Business today. Retrieved 14 June 2013. ^ Sachs, Jeffrey D. (6 March 2005). "The End of Poverty". Time. ^ "Students cry out: No reservation please | India News - Times of India". Timesofindia.indiatimes.com. 3 May 2006. Retrieved 16 August 2018. ^ "Direct SSA funds for school panels". Deccan Herald. Retrieved 14 June 2013. ^ "LS passes bill to provide IIT for eight states". Deccan Herald. Retrieved 14 June 2013. ^ "The Unlawful Activities (Prevention)" (PDF). www.nic.in. National Informatics Centre. Archived from the original (PDF) on 17 October 2016. Retrieved 17 August 2016. ^ TNN (16 December 2008). "Finally, govt clears central terror agency, tougher laws". Articles.timesofindia.indiatimes.com. Retrieved 28 September 2013. ^ K, Watfa, Mohamed (2011). E-Healthcare Systems and Wireless Communications: Current and Future Challenges: Current and Future Challenges. IGI Global. p. 190. ISBN 9781613501245. Retrieved 6 June 2018. ^ "Position of negotiation". Firstpost. Firstpost staff. Network 18. 9 January 2013. Retrieved 18 August 2014. ^ "India's prime minister, Manmohan Singh, in Beijing to discuss matters of trade and border defence". The Economist. John Micklethwait. The Economist Group. 26 October 2013. Retrieved 18 August 2014. ^ "Indian Prime Minister Manmohan Singh visits Beijing". China Briefing. Business Intelligence. Dezan Shira & Associates. 14 January 2008. Retrieved 18 August 2014. ^ Bajoria, Jayshree (23 October 2008). "India-Afghanistan Relations". Council on Foreign Relations. Archived from the original on 29 November 2008. Retrieved 11 December 2008. ^ a b "BBC NEWS - South Asia - India announces more Afghan aid". bbc.co.uk. ^ "U.S., India ink historic civilian nuclear deal". People's Daily. 11 October 2008. Retrieved 11 December 2008. ^ Haass, Richard N. (23 November 2009). "A Conversation with Prime Minister Dr. Manmohan Singh". cfr.org. Council on Foreign Relations. Archived from the original on 19 August 2014. Retrieved 18 August 2014. ^ "The 'peace pipeline'". www.thenational.ae. The National. Retrieved 18 August 2014. ^ "Several African leaders to attend Africa-India summit, AU says". African Press International. 28 March 2008. Retrieved 11 December 2008. ^ "India-South Africa relations" (PDF). mea.gov.in. Ministry of External Affairs, Government of India. Retrieved 18 September 2014. The Indian National Congress: An Historical Sketch, by Frederick Marion De Mello. Published by H. Milford, Oxford University Press, 1934. The Indian National Congress, by Hemendra Nath Das Gupta. Published by J. K. Das Gupta, 1946. Indian National Congress: A Descriptive Bibliography of India's Struggle for Freedom, by Jagdish Saran Sharma. Published by S. Chand, 1959. Social Factors in the Birth and Growth of the Indian National Congress Movement, by Ramparkash Dua. Published by S. Chand, 1967. Split in a Predominant Party: The Indian National Congress in 1969, by Mahendra Prasad Singh. Abhinav Publications, 1981. ISBN 81-7017-140-7. Concise History of the Indian National Congress, 1885–1947, by B. N. Pande, Nisith Ranjan Ray, Ravinder Kumar, Manmath Nath Das. Published by Vikas Pub. House, 1985. ISBN 0-7069-3020-7. The Indian National Congress: An Analytical Biography, by Om P. Gautam. Published by B.R. Pub. Corp., 1985. A Century of Indian National Congress, 1885–1985, by Pran Nath Chopra, Ram Gopal, Moti Lal Bhargava. Published by Agam Prakashan, 1986. The Congress Ideology and Programme, 1920–1985, by Pitambar Datt Kaushik. Published by Gitanjali Pub. House, 1986. ISBN 81-85060-16-9. Struggling and Ruling: The Indian National Congress, 1885–1985, by Jim Masselos. Published by Sterling Publishers, 1987. The Encyclopedia of Indian National Congress, by A. Moin Zaidi, Shaheda Gufran Zaidi, Indian Institute of Applied Political Research. Published by S.Chand, 1987. Indian National Congress: A Reconstruction, by Iqbal Singh, Nehru Memorial Museum and Library. Published by Riverdale Company, 1988. ISBN 0-913215-32-5. INC, the Glorious Tradition, by A. Moin Zaidi, Indian National Congress. AICC. Published by Indian Institute of Applied Political Research, 1989. Indian National Congress: A Select Bibliography, by Manikrao Hodlya Gavit, Attar Chand. Published by U.D.H. Pub. House, 1989. ISBN 81-85044-05-8. Indian National Congress in England, by Harish P. Kaushik. Published by Friends Publications, 1991. Women in Indian National Congress, 1921–1931, by Rajan Mahan. Published by Rawat Publications, 1999. History of Indian National Congress, 1885–2002, by Deep Chand Bandhu. Published by Kalpaz Publications, 2003. ISBN 81-7835-090-4. Bipan Chandra, Amales Tripathi, Barun De. Freedom Struggle. India: National Book Struggle. ISBN 978-81-237-0249-0. This page was last edited on 18 April 2019, at 10:35 (UTC).